If we told you rabbits are to thanks for today’s most successful tooth replacement method, dental implants, would you believe us? It’s true — the secret ingredient for dental implants’ success was discovered by a physicist who was actually working on a separate study on bone growth in a bunch of bunnies. Like all good scientific discoveries, this phenomenon that we now know as “osseointegration” was found by accident. Whether you’re missing an entire row of teeth or if you’ve never lost a single pearly white, we know you’ll be interested in the complete story. Keep reading to find out more about the surprising history of dental implants! Tooth loss has long plagued humanity — and humans have been working on fixing it for, well, forever. Mayan skulls dating back to 600 AD bear evidence of some of the very first dental implants. They placed shells and bones into the empty sockets. In fact, it wasn’t until the middle of the last century that the secret to implant dentistry was cracked. While studying bone regeneration in rabbits, Swedish physician Dr. Per-Ingvar Branemark found that titanium accidentally left behind fused together with the bone material. Applied to implant dentistry, this discovery was critical. It fixed the problem of implants being repeatedly rejected by the body. Using titanium implants, implant dentistry really began to take off — with Dr. Branemark known from then on out as the Father of Implant Dentistry. Yes, dental implants have changed a lot over the past several centuries — and the future has never looked brighter for implant dentistry! Dr. James Rynar is a true expert in implant dentistry. He was trained by the father of implant dentistry, Dr. Per-Ingvar Branemark. He has placed thousands of implants over the past 30 years — with a 10-year success rate exceeding 95%. 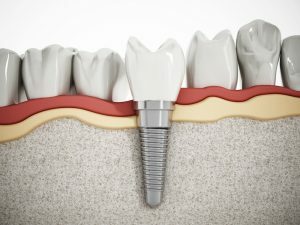 To learn more about dental implants and whether or not you are a candidate for this replacement option, call your periodontist in Florham Park at (973) 377-3131.